UCOG Today [Paul Kieffer] » Blog Archive » Don’t rat on me! Remember the expression "Keeping up with the Joneses"? What if you are a dog and your version of the "Joneses" are the three cats next door? Our dog Sue has developed a talent for catching and killing rats. When she has been on a successful hunt, she proudly brings her victim to the front door of the house, apparently intent on entering the house with her "trophy". 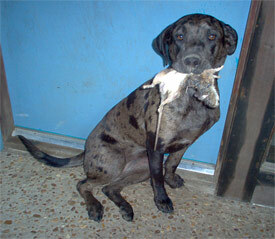 We like our dog, but we don’t like dead rats, so that is out of the question! The three cats next door occasionally catch rats, too, but generally they don’t stray too far from the house. By contrast, Sue takes off into the woods and nearby low marshy areas where she appears to have a field day with her newly discovered sport. With her electric dog collar with its quarter-mile range, Sue has learned to return to the house at the sound of a beep. Which is good – as long as she doesn’t have a rat between her teeth!